One of the most beautiful parts of Italy, the UNESCO World Heritage Site of the Orcia Valley has a multitude of layers to be discovered within this light adventure. As you walk along the famous “white roads/gravel roads” of Tuscany, enjoy stunning views and warm greetings from the people working and living on the surrounding land. Along the way you’ll meet female wine makers – a rarity in Italy, second-generation leather makers and other artisans. Cultural visits to the Monte Oliveto Maggiore Abbey and the towns of Montalcino, San Quirico d’Orcia and Pienza will round out this unforgettable, lesser known part of Tuscany. 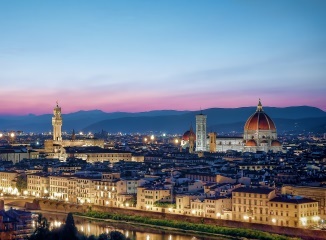 Arrive Florence and after clearing customs, you’ll be met by our representative and transferred to your hotel for overnight. Florence — the capital of Tuscany and a World Heritage Site since 1982 — lays claim to a priceless heritage, but it’s much more than a city filled with majestic Renaissance artworks. It also offers the visitor many museums, gardens, small piazzas, and contemporary art exhibitions to discover. Today is yours to explore Florence. 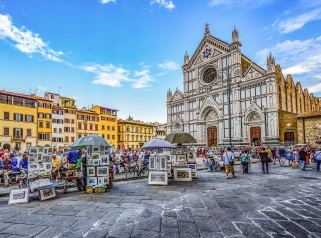 Visit the well-loved Uffizi Gallery, explore the beautiful interior of Santa Maria Novella with a peak at their ancient apothecary, or cross the River Arno and walk into less crowded areas of Florence, where the locals hang out. With your guide, pick up your rental car (not included) this morning and then head out for Monte Oliveto Maggiore Abbey together. This impressive Benedictine Abbey was built in the 13th century and is still home to Benedictine monks. The cloister and its beautiful frescoes are a must-see. From the Abbey, head off with your guide on your walk through the Tuscan hills where gravel roads and ridge trails will lead us along scenic views to your B&B, leaving your car at the Abbey. Stop for a delicious, traditional Tuscan lunch along the way. When you reach your B&B, your hosts will take you back to the Abbey to fetch your car. Evening is at leisure. Your hosts can provide you with the perfect recommendation for where to enjoy dinner. A sumptuous breakfast prepares you for your walk this morning to a winery famous for its all-female cast. 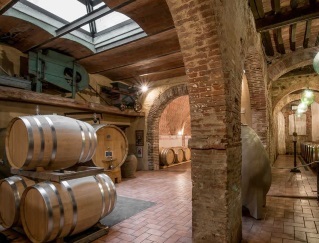 This winery has since become a powerful voice for female led companies all over Italy. Enjoy a light lunch and wine after your tour of the winery. Continue walking to your next visit with a two-generation leather maker in the nearby town of Buonconvento. Time permitting, after your visit to the leather maker, explore Buonconvento on foot before taking a taxi back to your beautiful B&B. Evening cooking class with your hostess, featuring fresh, local ingredients. Feast on the fruits of your labor afterwards. After driving to San Quirico, embark on a most charming walk to Vignoni Alto for lunch, wine tasting and a visit to a small family farm, where they grow grapes, olives and lots of other fruits and vegetables. Then walk to the intriguing town of Bagno Vignoni–whose piazza is filled with a thermal pool with warm waters running through canals built by the Romans, who enjoyed this hot water like we do today. 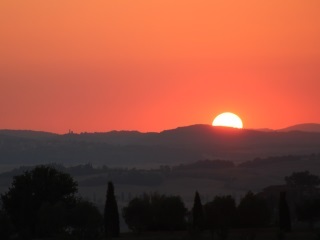 Take a taxi back to your car, then take the short drive to your accommodations in Pienza. Evening at leisure. Optional: Add on a hot springs experience in Bagno Vignoni. Enjoy a day at leisure to explore the infinitely charming town of Pienza on your own. Explore the town’s museums, galleries, shops and churches. Visit a local dairy and look for treasures in the shops of local artisans. Pienza was the home of Pope Pius II, who turned this tiny village into a showpiece of Renaissance town planning in the 16th century. 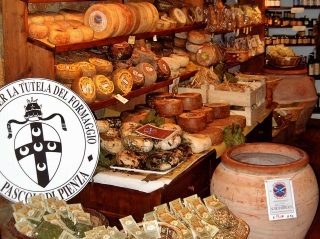 Today, the aroma of pecorino cheese wafts across the town as it is also well known for its cheese production. After a leisurely breakfast, prepare for your walk by shopping for your lunch, based on our suggestions. With lunch in hand, head towards Trequanda on this most iconic of walks! Stop at Pieve di Corsignano, a simple 12th-century Romanesque stone church. Continue on to picturesque Vitaleta Chapel, where you’ll stop for lunch and a rest. This tiny chapel is set among the rolling hills of Tuscany. Finish your walk in the ancient walled town of San Quirico. Make your way back to your car and then on to Trequanda and your agritourismo, built amidst a working winery. Check in, relax, and enjoy a glass of wine before dinner (not included). Today is dedicated to exploring the winery, property and the nearby town of Trequanda. Morning gentle loop walk in the nearby forested hills to search for truffles or mushrooms (depending on climate conditions). Late morning walk to Trequanda for a delicious vegan lunch with time to explore the town and the art in the forest on the walk there. Lunch not included. Late afternoon wine-tasting and tour of the property. Evening at leisure. Be sure to take advantage of the spa and their delicious treatments. Enjoy the scenic drive to Cortona for your next adventure. The beautiful city of Cortona lies in the mountains between the Valdichiana and Tevere valleys. Cortona was a very important center of Etruscan civilization, and these ancient settlements remain at the core of the city’s identity. Enjoy a bread-making class this morning with our energetic and enthusiastic local chef. After your class, enjoy a delicious lunch featuring your freshly baked bread. Check into your hotel and enjoy the rest of the day at leisure to explore the small, charming town of Cortona. Say goodbye to Italy and the charming province of Tuscany! Depart Cortona by car for the drive to the airport in Florence. Drop off your rental car and take the shuttle to the airport, and your homeward bound flight. • Rates shown are per person, double occupancy, based on a minimum of 4 travelers. Airfare not included.